The Financial Times has the largest number of followers on Google+, while the Daily Mail and Telegraph websites get the most Google +1 recommendations from readers, according to a release from analytics software firm Searchmetrics. Searchmetrics has looked at the Google+ presence of 13 national newspapers which have “a combined total of 544,545 followers”. This compares with a total of 1,284,674 followers (fans) on Facebook, currently the world’s biggest social network, for which all 13 newspaper sites maintain official pages. The social network, which was launched nine months ago, has more that 100 million user accounts, according to Google. 372,159 people were recorded as following the Financial Times’ page on Google+ (or having the newspaper’s page in their Google+ ‘Circles’) beating the Guardian’s page which came second with 75,255 followers. The Independent came third with 60,195 people having its page in their Google+ circles. In the release Searchmetrics points out that the Times, the Sun, Daily Express and Daily Star have not created a Google+ page for their news sites. Searchmetrics found stories and content from the Daily Mail website received the most recommendations from people using the +1 button, with approximately 10,493 +1s a week on average. Second came the Telegraph website with around 5,822 +1s a week and third was the Guardian with around 3,367 +1s a week. While the Financial Times has the most followers it averages around 670 +1s a week, probably due to its metered paywall. The most frequently +1’d article on Daily Mail site was “a story (with images) about how the majority of runway models meet the Body Mass Index (BMI) criteria for anorexia”. It had been +1’d 837 times. This contrasts with the Mail’s most “liked” story of 2011, which saw more than 62,458 people click the Facebook like button. This story was headlined “the 9/11 rescue dogs: Portraits of the last surviving animals who scoured Ground Zero one decade on”. See our story on the top 10 Facebook stories of 2011 (we used Searchmetrics to gather the data). Google+ is still a relatively young social network but Google is very positive about its future and we’re already seeing a large number of people on the site, so it’s important for newspapers and other big brands to get in early and have a strong presence on the network. This entry was posted in Social media and blogging and tagged Google Plus, searchmetrics, social media on March 22, 2012 by Sarah Marshall. News outlets and brands can now create a Google+ page, something many organisations have been attempting to do since the launch of the social network in June. Google previously pulled accounts set up by companies and appealed for patience. Yesterday Google announced pages in a blog post and said the roll-out was imminent. That has now happened and pages are open to all. Journalism.co.uk now has a page on Google+, which you can connect with here. To create a page for your news organisation select ‘company, institution or organisation’ and the ‘media, news and publishing’ category. After an initial rush to join Google+ interest then waned. Journalists received an extra incentive to join last week when Google announced that journalists with a Google+ account can get a photo byline on Google News. This entry was posted in About us, Social media and blogging and tagged Google Plus, Journalism. co.uk, social media, social networking pages on November 8, 2011 by Sarah Marshall. Google has started the roll out of a new feature giving journalists a photo byline for stories displayed on Google News. But there is a caveat – for the byline to be displayed journalists must have a Google+ account. The highlighted picture and author name will show how many followers that journalist has, which may encourage more connections as readers can then choose to add the named journalist to one of their Google+ circles. It could be a smart move from Google’s point of view as it could encourage journalists to start using Plus and may prompt those who signed up early but whose interest has since waned to pay more attention to the social network. There are instructions on how to link your Google profile to your news stories to enable your photo byline to appear in Google News. 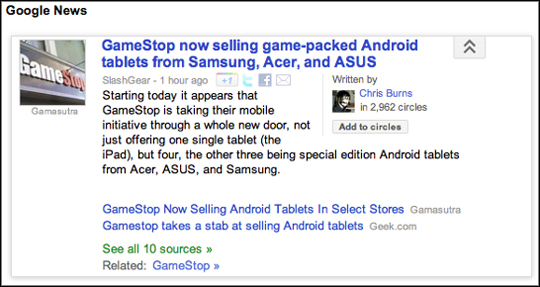 An announcement on the Google blog fully explains how and why journalists are to be highlighted in Google News. This entry was posted in Social media and blogging, Traffic and tagged Google Plus on November 3, 2011 by Sarah Marshall. Google+ users can now share their circles, one of the key features of the social network which launched in private beta three months ago and is now open to all. Users create their own circles and give them a name, such as ‘journalists’, ‘city councillors’ or ‘PRs’. They can then read news from members of a particular circle and share updates with one or more specific groups. A link now appears when you hover over a circle that allows you to share it with a contact. Your circle remains hidden and confidential from others and is not updated in your contact’s account when you add more individuals. 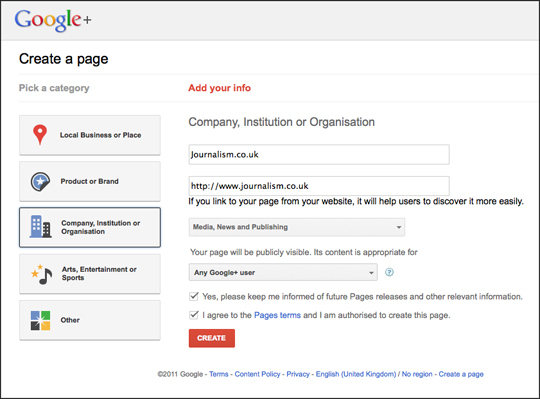 Journalism.co.uk will now create a master list of UK-based journalists on Google+. When we have built the circle we will share it with those who request our circle. We will be doing this from John Thompson, owner and managing director of Journalism.co.uk’s account as Google+ does not yet allow news sites or brands to create an account. You can connect with John at gplus.to/JohnCThompson and fill in the form to let us know you would like us to share the Journalism.co.uk master list with you. This entry was posted in Social media and blogging and tagged Google Plus, journalists, social networking on September 27, 2011 by Sarah Marshall. 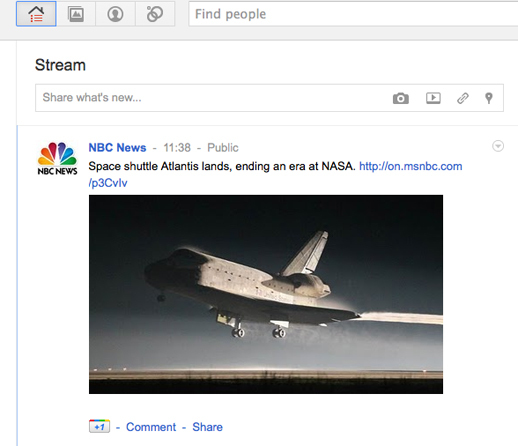 Google+ is now open to all – but are journalists using it? Google last night (Tuesday, 20 September) announced that its social network is now open to all. The was much optimism about Google+ when it launched in June, particularly among some journalists who were quick to share invites and sign up, but who is now using the newest social network? A quick straw poll on Twitter suggests many are nonplussed (see tweets below). Technology journalists, including the BBC’s Rory Cellan-Jones and Channel 4 News’ Benjamin Cohen – an early advocate who predicted Google+ could be a Twitter killer – are among those posting with enthusiasm. So are journalists using all the features available? Despite these 10 ways journalists can use Google+ it appears most are simply using Plus for sharing stories and for conversations around them but are getting quality comments and a high level of engagement. Even if you do not feel inclined to post or try out new features such as hangouts (video calls) on your phone, it is worth journalists being aware of one new feature: improved search – something Google should be good at. You can now search topics as well as people. With more than one billion items shared and posted on Google+ every day, according to the announcement, it is worth keeping Plus in mind as a newsgathering tool. This entry was posted in Social media and blogging and tagged Benjamin Cohen, Google Plus, Rory Cellan-Jones, social media tools on September 21, 2011 by Sarah Marshall. 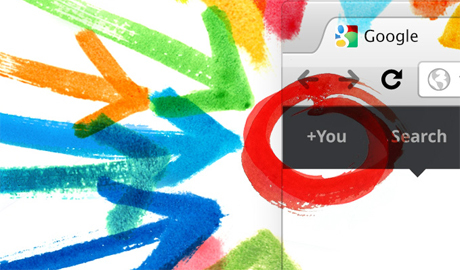 Google+ users can now use the +1 button to share content with their circles of contacts within the new social network. Following the development this week the button will act like Facebook’s share button in that anyone with a Google+ profile can directly share a link to their wall (or stream in Google+ terminology). Google made the announcement on its blog yesterday and said it would be rolled out over the next few days. The +1 button was launched at the beginning of June, allowing anyone logged in to a Gmail account to recommend web content to their contacts, who would then see a personally ranked suggestion when using Google Search. At the end of June Google+ was launched by the search engine giant which appeared to be taking on Facebook by creating its own social network. The fact the button now acts like a Facebook share widget may persuade a few more news sites to adopt it. Take up early on appeared to have been slow based on often lower traffic referrals when compared to other share buttons. In yesterday’s blog post, Google also announced another development of interest to publishers: the creation of “snippets”. When you share content from the +1 button, you’ll notice that we automatically include a link, an image and a description in the sharebox. We call these snippets, and they’re a great way to jumpstart conversations with the people you care about. Of course: publishers can benefit from snippets as well. With just a few changes to their webpages, publishers can actually customise their snippets and encourage more sharing of their content on Google+. More details are available on the Google Webmaster blog. The video below takes you directly to an explanation of snippits. This entry was posted in Social media and blogging, Traffic and tagged buttons, Facebook, google, Google blog, Google Plus, social networks on August 25, 2011 by Sarah Marshall. A fortnight ago Journalism.co.uk suggested 10 ways journalists can use Google+. Here are another 10 tips, tricks and tools from across the web for reporters wanting to engage with the estimated 20 million Google+ users. Google+ is quietly adding new features, such as the ‘upload address book’ function which allows you to upload address books from Outlook, your Mac, and more, as this post on TechCrunch explains. Another really handy trip for journalists is to follow this guide from Read Write Web, which explains how you carry out a profile search. It uses a feature in Google Chrome which lets you add custom search engines to your browser. Here is a tip from Prashant Rao who has written a primer on how journalists can use Google+. This tip is based on a 10,000 words post. If a follower happens to be at the site of a news event (say, a massive tornado) that you cannot attend, they could be encouraged to tag your Google+ profile so that you are instantly made aware that they’ve uploaded it. This could be very useful in situations where journalists cannot be physically present at the site of major news events (as was the case in Iran in 2009, for example). Given Google’s Picasa (which is integrated into Google+) is already a simple but robust photo-uploading platform, this removes the need for news organisation to create their own bespoke solutions. The Guardian has a post on aggregation tool MultiMi. Israeli startup Zbang has taken a logical approach to the problem of information management with the launch of MultiMi, a free desktop dashboard tool for PCs that aggregates a dozen different services including Facebook, Twitter, email and photo-sharing. Launched based on tests with a small group of alpha users up to now, the software is initially PC only but Zbang’s team of eight will be expanding MultiMi with support for some tablets and eventually a mobile version. Since its launch earlier this week, the new iPhone app has gathered almost 300 ratings, a three star ranking, and it is the top free app on Apple’s iTunes. The native and web-based apps are at this link. Sarah Hill, an anchor for KOMU-TV in Columbia, Missouri, has been inviting her Google+ fans to join her in hangouts, the network’s video chat service. KOMU hosts a hangout during the 5pm newscast to give viewers a behind-the-scenes look at the newsroom. She then interviews people in the hangout on-air about their reactions to the day’s news. Mashable points out that several news organisations have brand profiles on Google+, despite Google asking brands not to create a profile and instead add their names to a request list. Some profiles, such as those set up by ITV News and Canadian broadcaster CBC, appear to have been removed. 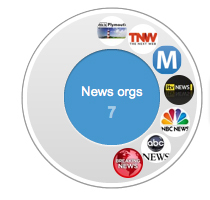 Those with accounts include This Is Plymouth, The Next Web, ABC News, NBC and Mashable. As news organisations join early, and following brands’ enthusiasm to join Google+, Poynter reports Google is accelerating business profiles. A Google executive now says it will pick partners next week to test official business profiles, while continuing to deactivate the unofficial profiles that have sprung up. “Thousands upon thousands of businesses” have applied to join the trial programme, Christian Oestlien wrote. After the trial, business profiles should be open to all later this year. This is another tip from Rao. He explains how one news outlet is engaging with readers. Canadian broadcaster CBC ran a daily caption contest on its Google+ site (now closed) — not everything has to be just about publishing content and then waiting for readers/viewers to respond. You can share news or ask contacts questions by adding your contacts to circles. The beauty is that your contacts don’t need to be on Google+ as they will receive an email update. There’s more on how to organise your circles here. Another tip from Rao considers sparks. He hopes the feature will be handy for following topics. In my limited playing with sparks, it’s a little raw and not particularly pointed, but given it’s based on Google’s search result rankings and +1 results, it could well develop into a useful tool. For now, I’ll use it, but not give up on my RSS feeds just yet. For essential reading on Google+ as it nears 20 million users, go to this link. This entry was posted in Editors' pick, Handy tools and technology, Social media and blogging and tagged Google Plus, multimi, Prashant Rao on July 21, 2011 by Sarah Marshall. Much has been written about Google+over the past few days as it continues to grow at a record-breaking pace. Here are a few links from around the web on how Google+ is shaping up, plus this post on tips, tricks and tools for journalists using the social network. What shape is Google+ taking? The Guardian is reporting Google+ is approaching 20m users just three weeks since it launched as a rival to Facebook. But “Google’s social juggernaut is beginning to show signs that it’s losing steam”, according to this post on Mashable. In the Guardian article Paul Allen, the founder of Ancestry.com, said his calculations suggest Google+ is gathering 750,000 new users per day. Allen explains his methods: “I don’t have access to log files or to a massive consumer panel. I’m simply measuring how many Google+ users there are of various randomly selected surnames every day. Last week I increased the sample of surnames that I query from 100 to 1,000. Over a four-day period, the 100-surname sample showed a Google+ growth rate of 28.4 per cent. The 1,000 surname sample showed a growth rate of 28.5 per cent. [That’s] statistically insignificant. Mashable has a post looking at the key findings of a report by Experian Hitwise, which includes that 57 per cent of Google+ users are male. Google+ is dominated by young adults. Its biggest age group for the four weeks ending July 14 was the 25-34 age bracket, which accounted for 38.37 per cent of all visits. The week before, the entire 18-34 age bracket made up just 38.11 per cent of total visitors. Read Write Web has been taking a look whether Google+ is causing Twitter and Facebook useage to decline and, though the research methods are not scientific, the hunch is that Plus is having an impact on the use of its rivals. That is a view seemingly shared by LinkedIn CEO Weiner. He thinks Google+ has changed the social landscape but there’s not much room left, according to a post on the New York Times. Looking at the broad social landscape, Weiner said LinkedIn was for professionals, Facebook for family and friends, and Twitter for broadcasting short thoughts and information. He noted that these three networks coexisting made for an “understandable landscape”, but when Google+ gets added to the mix, people have less time and will have to start making choices about where to spend that time. “All of a sudden, you say ‘where am I going to spend that next minute or hour of my discretionary time?’ and at some point, you don’t have any more time to make choices,” Weiner said. [He added] Google+ could follow Twitter in attracting celebrities and other well-known figures to help it become a more competitive service. Some celebrities have already joined, and a couple are among the most followed people on Google+. The Telegraph has been looking at who has the most followers. Many are Google bosses, plus there is blogger Robert Scoble and actress Felicia Day. Over on the Next Web there are some thoughts on what Google+ means for your social media policy. The post states G+ is a gamechanger. It’s all about the circles. Google+ actively encourages you to have ‘work’ and ‘friends’ as your circles. It’s a mindset shift. If you think about the user experience, Facebook is about sharing with friends and family. LinkedIn is about professional connections. Twitter allows you to choose for yourself what it’s about (see Getting past the Oprah Barrier for more about this). The Google+ user experience is all about the networks. 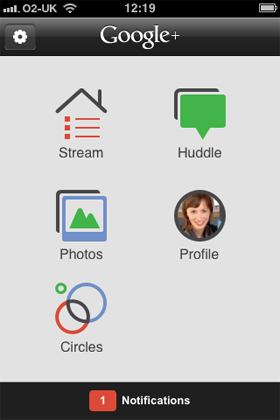 The Google+ experience is all about creating sub-networks of your life (circles) and populating those appropriately. This means that users will gravitate towards having complicated, overlapping circles and the Google+ stream is a mix of personal and professional connections. This also means that the Google+ share box becomes a place where it is much easier to inadvertently share inappropriate content than perhaps the LinkedIn share box. From a policy perspective, that’s a whole lot of scary. If you are a journalist and not yet on Google+ and would like an invite, fill in this form and I will attempt to invite you. This entry was posted in Editors' pick, Social media and blogging and tagged Google Plus, mashable, New York Times, Read Write Web, social media, The Guardian, The Next Web on July 21, 2011 by Sarah Marshall. Forbes is reporting that Facebook is working with a handful of major news organisations to create Facebook editions of their sites. Google is also working on similar plans, Jeff Bercovici reports. The idea is just one of the ways Facebook is trying to encourage users to spend time within its virtual walls to position itself against the growing popularity of new social network Google+. One answer it has come up with: asking a select number of news outlets to produce “Facebook editions” — basically, app versions of themselves that can be read and consumed right there on Facebook. About a dozen news outlets are currently participating, including CNN, the Washington Post and the Daily, according to sources familiar with the project. The first Facebook editions are expected to arrive later this year, perhaps in September. This entry was posted in Editors' pick, Social media and blogging and tagged Facebook, Forbes, Google Plus on July 20, 2011 by Sarah Marshall.